Independence Day didn't feature the only fireworks of the week. The second quarter went out with a bang, too. Enjoy Independence Day! Regular economic blogging will resume tomorrow. The American Revolution is a reminder that, just because a county is a representative democracy, it can't behave like a total d*ck towards a minority subject to its jurisdiction. 238 years ago, the Founders decided to see if a modern Republic, grounded on the principles of the Enlightenment, could successfully overcome the flaws that had brought down its ancient predecessors. The experiment is still in progress. Before we leave today's employment report, here is one more item of interest, which I overlooked this morning. Comparing apples to apples, this is only 0.1% higher than 1995, and 0.5% higher than 2003. Not "good," but definitely moving in the right direction. This is the right way to account for discouraged workers. Any other calculation you read that extrapolates estimates from a decade ago, or assumes no Baby Boom, is a waste of math. I think I have found a better measure of labor utilization than Paul Krugman's employment to population ratio of people aged 25-54. It is also a measure which fully responds to the one notable weak point in today's employment repart. More hours were worked in the economy in June vs. May. As usual, in the real world DOOM has failed to appear. This tells us the number of working hours available in the economy to those in what is usually thought of as the working age demographic. It clearly shows that the economy was at its best ever in the 1960s, and had its biggest boom in the last 40 years during the tech boom of the late 1990's. It also shows that the worst times for labor were in the 1973-74, 1981-82, 1990, and the 2008-09 tecessions. The number and percentage of people over 65 staying in the labor force force past age 65 has been increasing for 20 years, showing the effects of increasing healthy longevity. This even affects Krugman's preferred metric of the employment to population ratio of those ages 25-54, because the longer Boomers stay in the work force, the fewer job openings there are for members of Gen X and the Millennials. In short, since 1973, only the top of the tech boom, and 2007, were the only times in which the work available to the prime working age labor was higher than it is now. 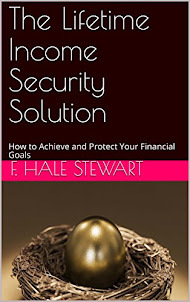 If more Boomers can be enticed to really retire, the lot of the prime age working population will improve substantially. 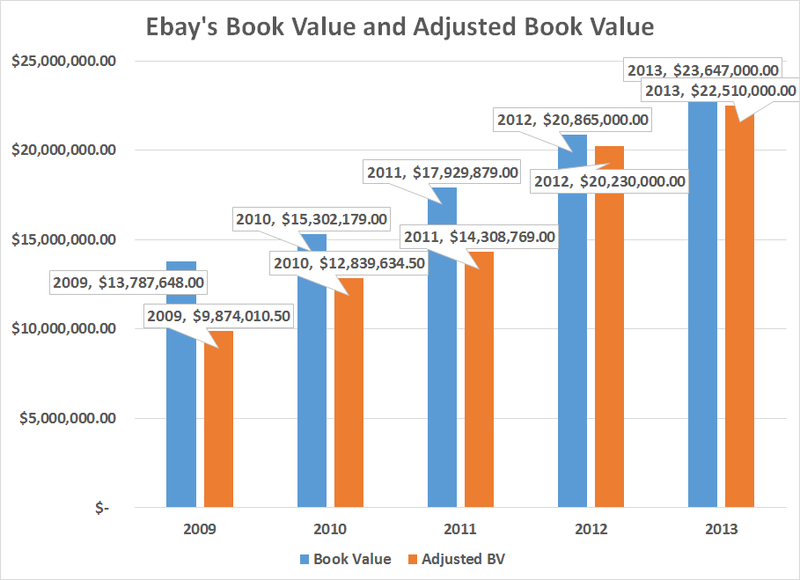 For the first part in this series on EBay's balance sheet, please go to this link. Over the last 5 years, the gross margin has declined from 71.58% in 2009 to 68.62% in 2013 -- a drop of about 4%. This isn't fatal; it does indicate the COGS has increased slightly over the last 5 years. At the same time, the operating margin has increased from 16.69% to 21.01%. The primary reason for this increase is SGA expenses as a percent of gross revenue have decreased from 37.86% in 2009 to 29.68% in 2013. The net margin has decreased from 27.37% in 2009 to 17.8% in 2013. But this drop is a bit of a misnomer; in 2009, the company recorded $1.4 billion in "other" income, in addition to income from continuing operations. In other words, a net margin in the high teens (17%-19%) is far more customary. The decrease in the SGA expenses is encouraging, as it indicates costs are clearly under control. That's always a good sign. 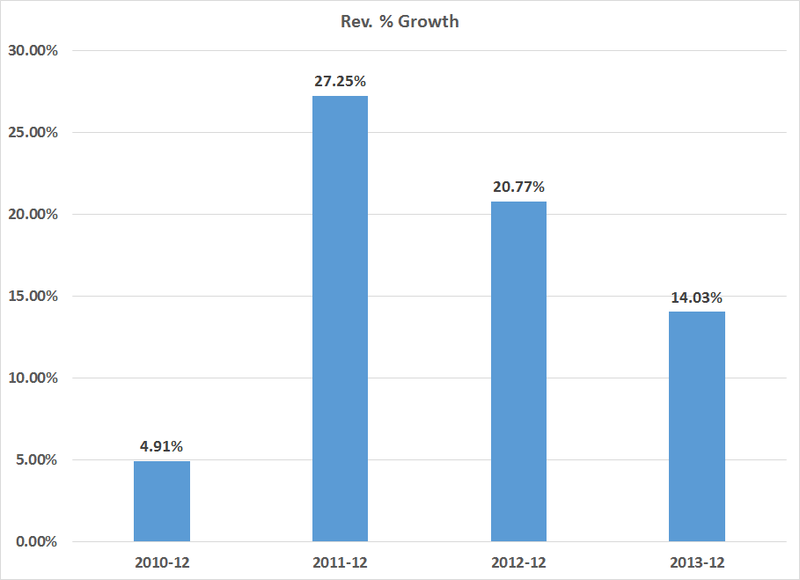 And the overall consistency in the revenue statement's margins also tells us management has a steady and disciplined hand. Coming out of the recession, growth was slow at a bit under 5%. 2011 and 2012 had some strong growth (perhaps pent-up demand kicking in) while 2013's figure was a bit more subdued. However, for a maturing company like Ebay, 14% is certainly nothing to sneeze at. 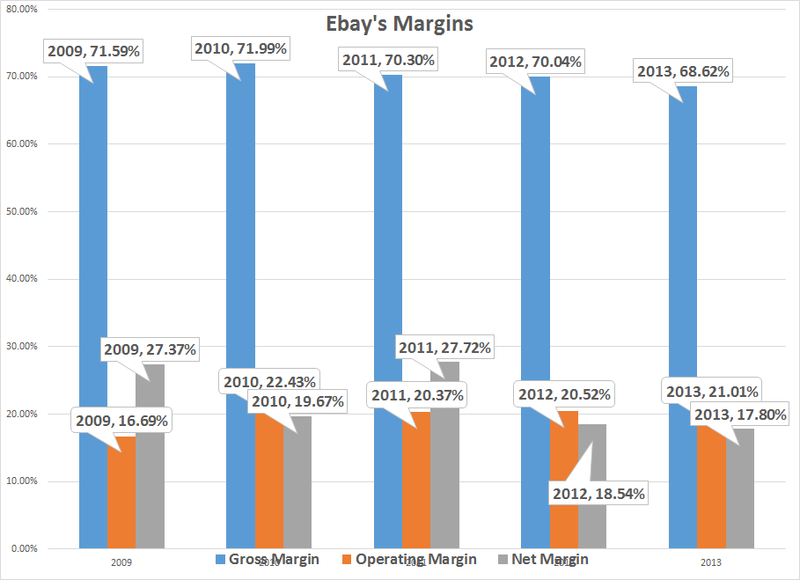 Given Ebay is a mature company, top line revenue growth in the 14%-20% is far more likely. Let's turn to the cash flow statement, starting with the relationship between operating earnings and investment activities. A mature company like Ebay should be able to derive investment funds from its operations, thereby freeing it on the financing side. These investments have gone both to cash (in the form of short-term securities) and overall investments. Finally, let's turn to the financing section of the cash flow statement. It shows two points. 1.) Over the last five years, Ebay has issued $4.4 billion in debt and repaid $1.5 billion, for a net change in debt outstanding of $2.8 billion. 2.) Ebay has repurchased a little over $4 billion in stock. Overall treasury stock has increased from $5.3 to $9.3 billion. Total retained earnings have increased from $8.3 billion in 2009 to $18 billion in 2013. The board is obviously paying shareholders now in the form of share buybacks. 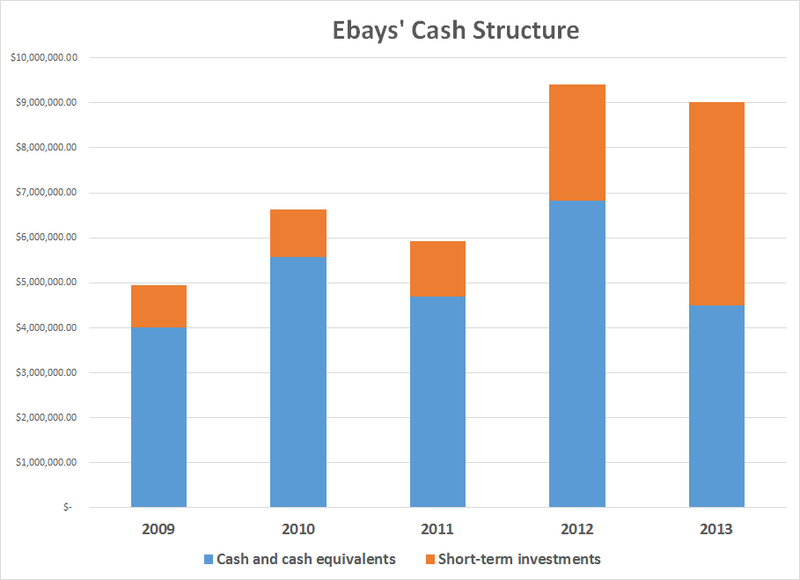 But, given that high level of retained earnings and EBay's ability to generate cash, a dividend might be in the future. 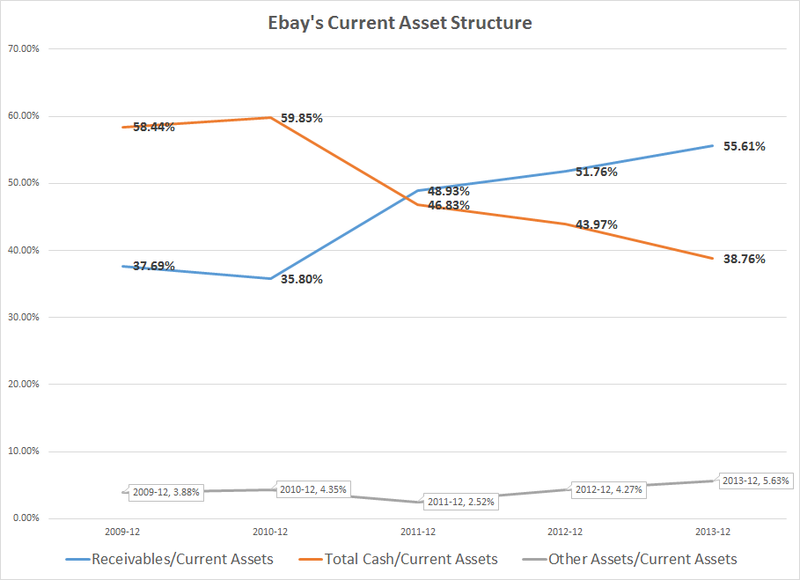 So, to conclude, EBay's management has costs under control as evidenced in the income statement. Margins have been constant and growth has been steady. I would expect a drop in annual growth rates to the high teens in the future. The cash flow statement indicates the company has the ability generate a large percentage of its investment needs through ongoing sales, freeing the company up when it comes to structuring their financing. 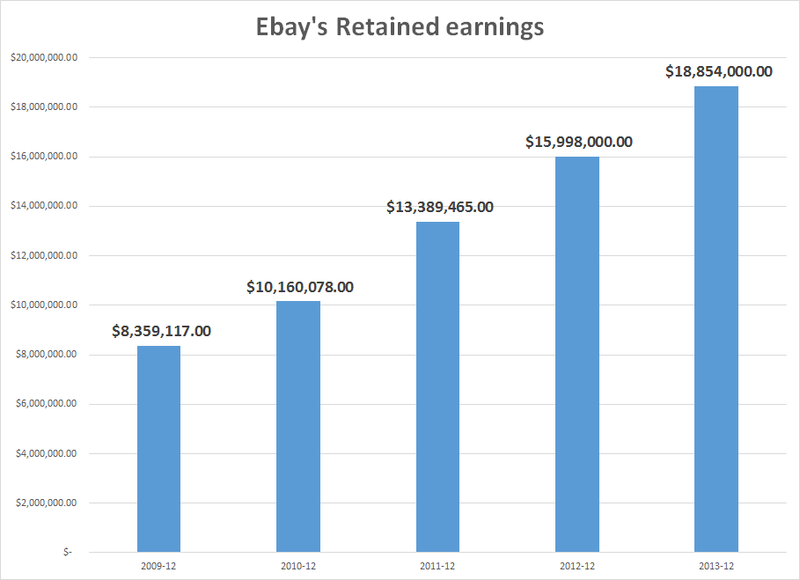 Simply put, EBay's a solid company. What do the long leading indicators forecast for 2H 2014 and 1H 2015? With the first half of 2014 in the books, I take a look at the long leading indicators, that usually turn a year or more before the economy turns, at XE.com. We now can begin to see the outlines of the first half of 2015. Ebay was trading between the upper 40s and upper 50s for most of last year. Momentum has been declining and the CMF indicates volume is starting to flow out of the stock. This is not an encouraging picture from a technical perspective. 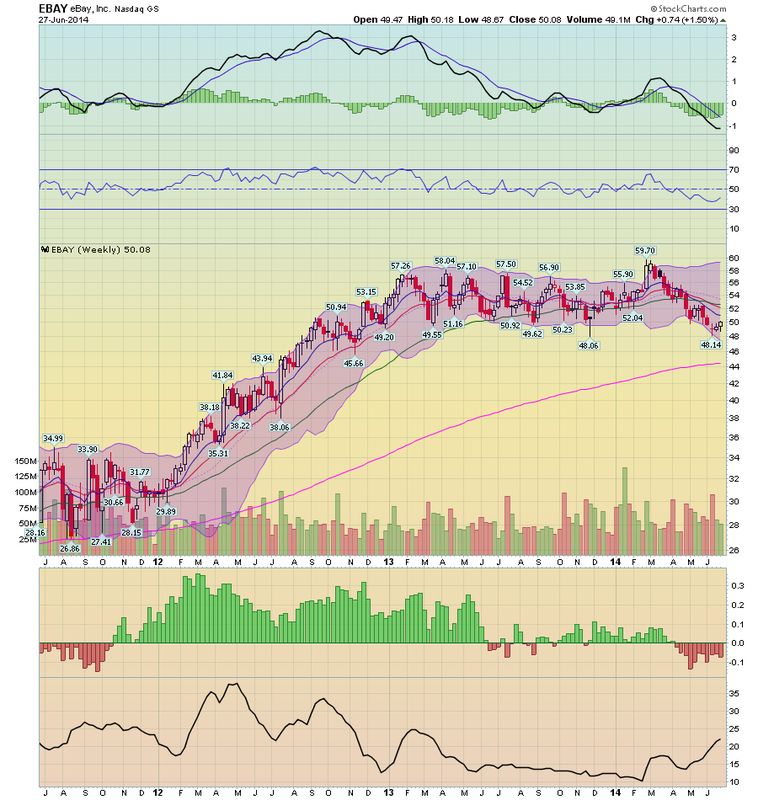 The chart above shows EBAY/SPY. The declining nature of this relationship indicates the SPYs are outperforming EBAY. Clearly there is something about the company the market does not like, which led me to look at EBAYs' financials. In the following analysis, I downloaded a spreadsheet of Ebay's balance sheet, income statement and cash flow from Morningstar.com. Short-term investments, which may include marketable equity securities, time deposits, certificates of deposit, government bonds and corporate debt securities with original maturities of greater than three months but less than one year when purchased, are classified as available-for-sale and are reported at fair value using the specific identification method. Unrealized gains and losses are excluded from earnings and reported as a component of other comprehensive income (loss), net of related estimated tax provisions or benefits. Long-term investments may include marketable government bonds and corporate debt securities, time deposits, certificates of deposit and cost and equity method investments. Debt securities are classified as available-for-sale and are reported at fair value using the specific identification method. Unrealized gains and losses on our available-for-sale investments are excluded from earnings and reported as a component of other comprehensive income (loss), net of related estimated tax provisions or benefits. Certain time deposits are classified as held to maturity and recorded at amortized cost. Our equity method investments are investments in privately held companies. Our consolidated results of operations include, as a component of interest and other, net, our share of the net income or loss of the equity method investments. 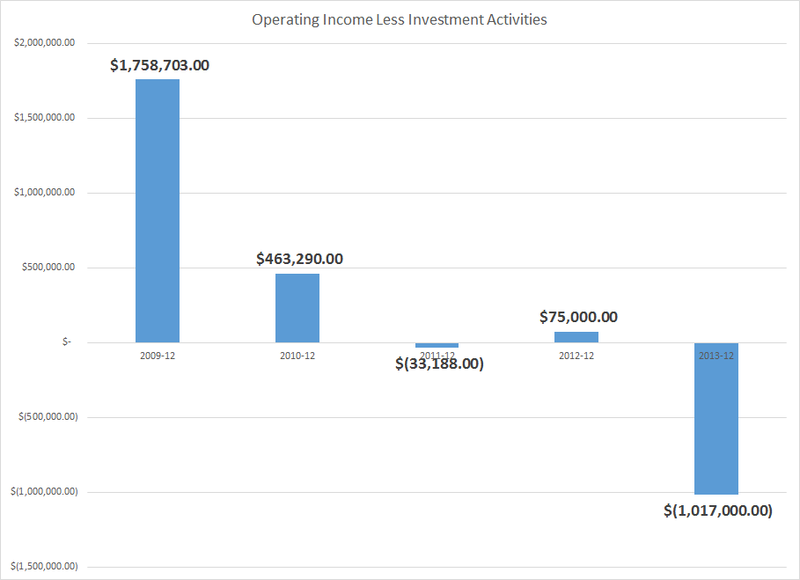 Our share of investees' results of operations is not significant for any period presented. Our cost method investments consist of investments in privately held companies and are recorded at cost. Amounts received from our cost method investees were not material to any period presented. We assess whether an other-than-temporary impairment loss on our investments has occurred due to declines in fair value or other market conditions. With respect to our debt securities, this assessment takes into account the severity and duration of the decline in value, our intent to sell the security, whether it is more likely than not that we will be required to sell the security before recovery of its amortized cost basis, and whether we expect to recover the entire amortized cost basis of the security (that is, whether a credit loss exists). 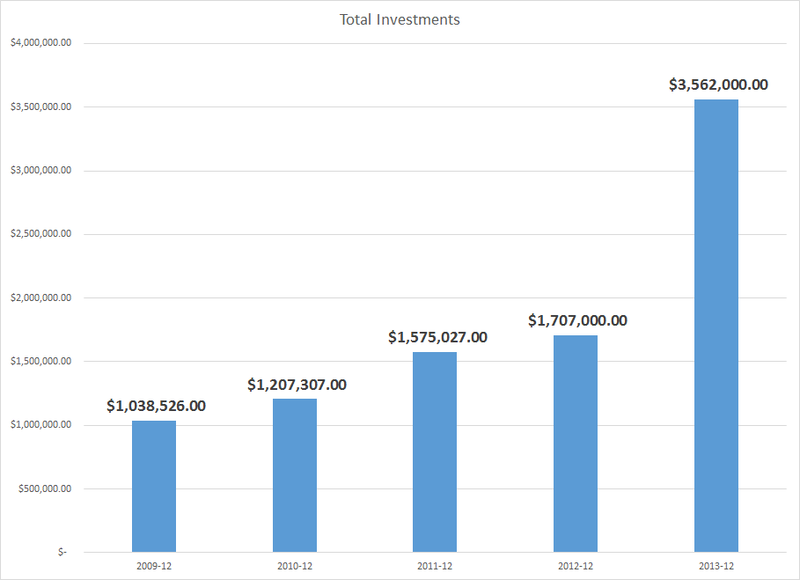 We did not recognize an other-than-temporary impairment loss on our investments in 2013, 2012, or 2011. The 10-k does not break down investment holdings, except to note they are short-term. 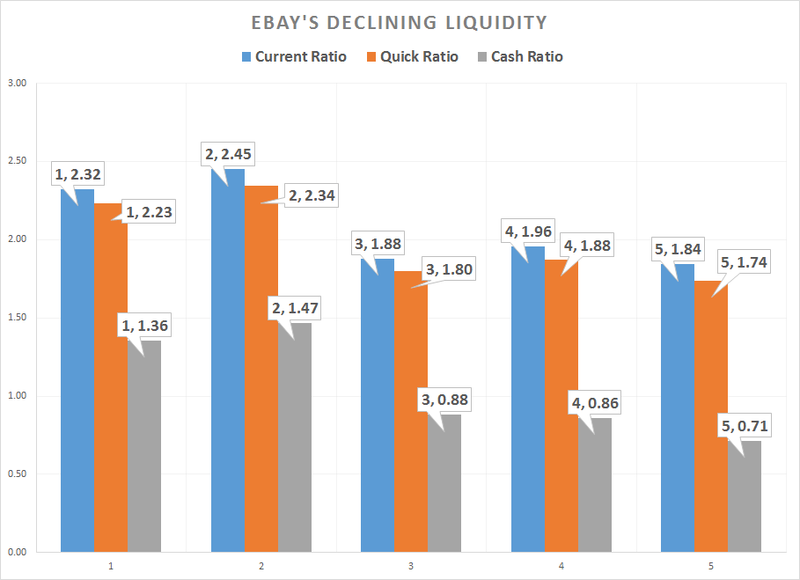 All of EBAYs' short term liquidity measures -- from the more liberal current ratio (assets/liabilities) to the more conservative cash ratio (cash/short term liabilities) -- are declining. What's important about this decline is it can't be attributed to a shifting of assets from cash to investments. If that were the case, we'd see a decline in the cash ratio but an increase in the quick ratio. Instead, all are moving lower. However, this is not a fatal development. In fact, it's by design. 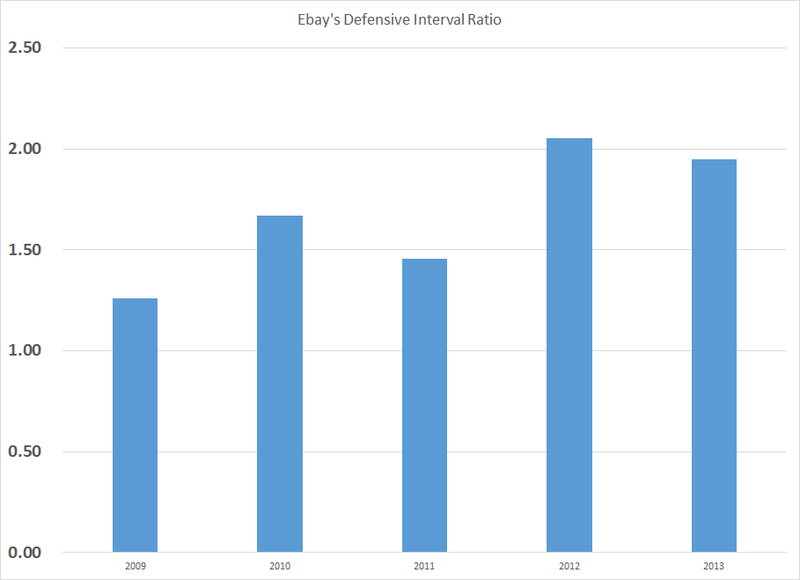 The defensive interval ratio has never fallen below 1 in the last five years. In addition, the company has a large credit facility. From their 10-K: We also have a $3.0 billion revolving credit facility, under which we maintain $2.0 billion of available borrowing capacity in order to repay commercial paper borrowings in the event we are unable to repay those borrowings from other sources when they come due. As of December 31, 2013, no borrowings or letters of credit were outstanding under this revolving credit facility and, accordingly, $1.0 billion of borrowing capacity was available for other purposes permitted by this credit facility. 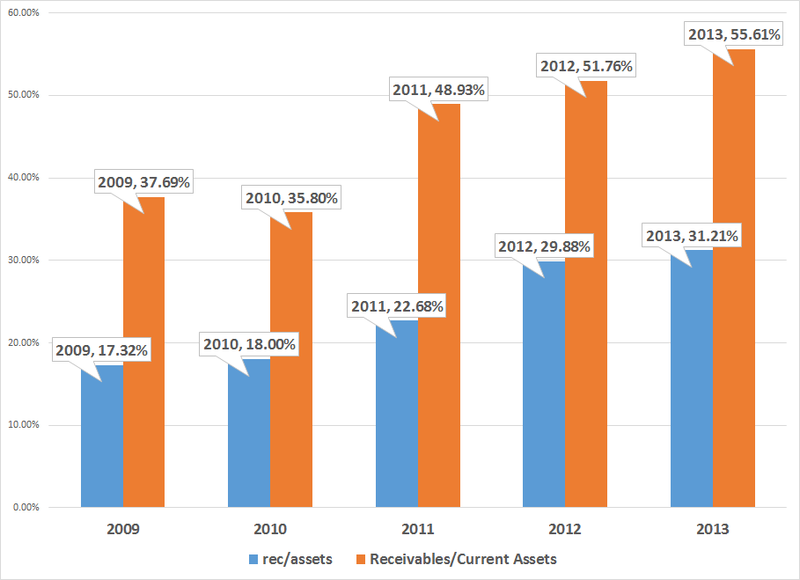 Receivables have increased as a percentage of assets from 37.69% in 2009 to 55.61% at the end of last year. As a result, we've seen a decrease in cash from 58.44% to 38.76%. 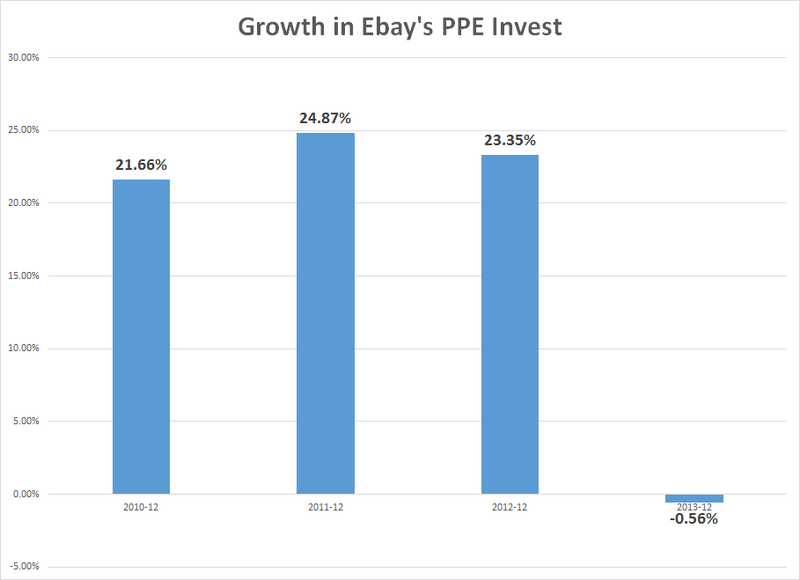 Over the same period, Ebay has been increasing its payment business, which explains some of the increase. However, the increase doesn't explain the entire growth, seen on the chart below in comparison to the growth in receivables. 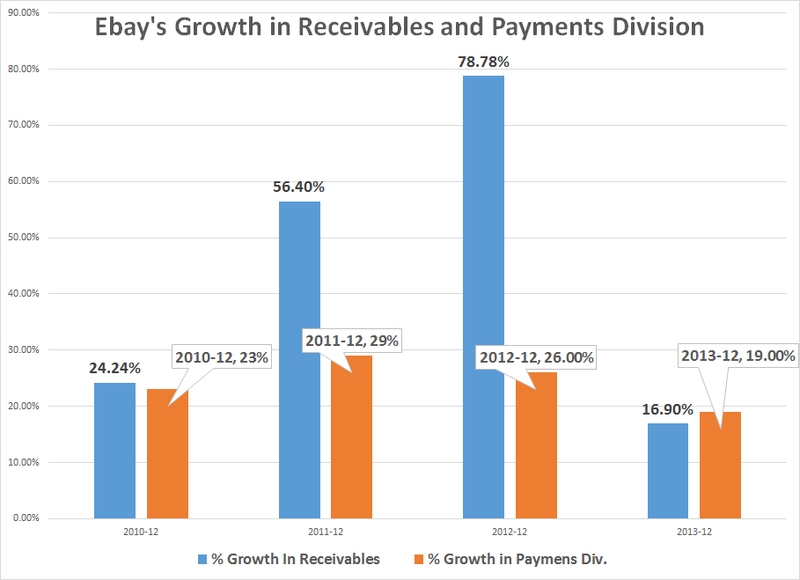 In two years, receivables and payments grew at similar rates. 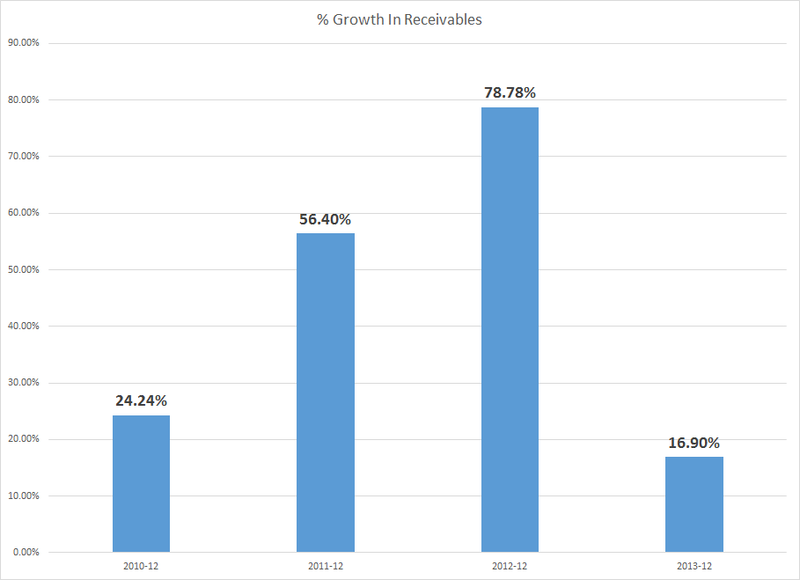 However, in 2011 and 2012 receivables growth far out-stripped the growth in payments. It's obvious that Ebay is expanding its revenue streams and is developing payment systems for this purpose. However, Ebay's core competency is online auctions. In getting into the payments business, Ebay is become a de facto lender -- albeit to a large number of extremely small creditors. Peter Lynch called this type of activity "de-worsification," which implies the company is expanding its business into a market segment that it knows little about. Ebay's balance sheet is financially solid. Over the last five years they have shifted a larger percentage of their cash assets into securities with the hopes of increasing their short-term yield. Despite declining liquidity ratios, their defensive interval is still solid, indicating they have more than enough cash on hand. 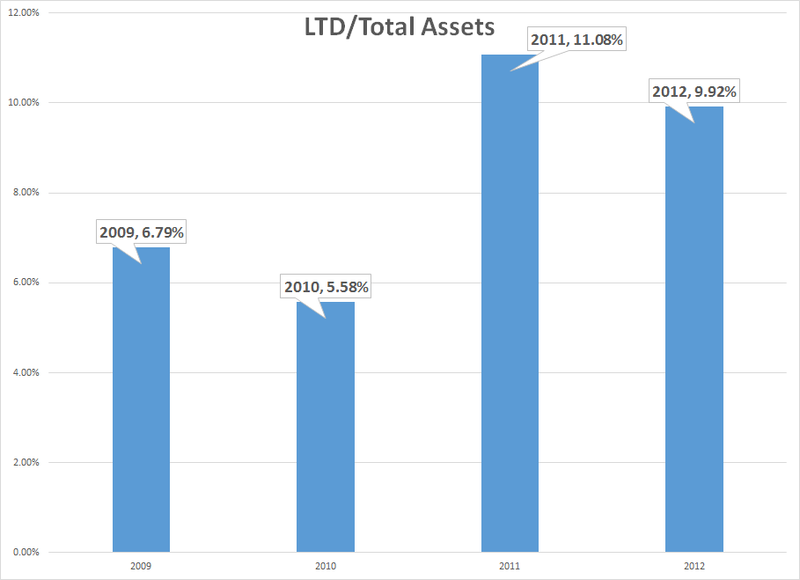 Book value has been growing at a good clip and the LTD debt/assets ratio's highest level over the last 5 years is 11%. The one area of concern is the growth in receivables, which could indicate the company is relaxing credit standards at the expense of prudent management. It could also be a sign the company is moving away from its core competency of online auctions. Who gets to make appointments to the Supreme Court from 2017 through 2020? There really is no other issue. And no whining about stare decisis, if it is a Democrat. Once again today the revanchist 5 indicated that a long-time precedent, this time from 1977, should not longer be treated as valid. What goes around, comes around. Now that we are half the way through 2014, let's look at where each of those points in the cycle stands. Interest rates on mortgages went up about 1.4% between May and July of last year. On 16 of 19 occasions since the end of World War 2, that big a change led to a YoY decline of at least -100,000 in permits. In this case, housing permits have gone sideways, with small YoY% declines in several months, including May, since the beginning of this year. As you can see, these generally are mirror images of one another. I suspect the situation this year is analogous to the late 1960's, when Boomers first reached adulthood and the existing aparment stock was nowhere near adequate to the task. Multi-unit starts skyrocketed, despite higher interest rates, while single family homes languished. It was an era of generally rising interest rates, and any temporary decline was met with heightened housing activity. Both of these graphs show the clear deceleration in the housing market through 2013 and through March 2014. Whether the spike in starts and new home sales in April and May means the trend has bottomed, or whether these are payback for particularly bad winter season reports, remains to be seen. This morning we got the final report, pending home sales, which surged by +6.1% in May compared with April, but was still down -5.2% YoY. As I wrote last week, May new home sales were as big an outlier to the upside as March was originally reported to the downside. March was subsequently revised about 10% higher. So we should be mindful of revisions, and I think the best way to look at the number is to average March through May, which combined are only about 1% higher YoY. Today's pending home sales report also adds unusually useful information. In the late 1960s and 1970s, the era of rising interest rates, buyers would pick and choose when to buy, and would pounce whenever there was a meaningful, if short term, did in rates. In May of this year, mortgage rates got as low as 4.12%, the lowest since June 2013 but for one week in October. Since pending sales are based on contract signings, it is likely that buyers jumped in response to these low rates. It is easy to see that it is multiunit construction, especially beginning in the second half of 2013, that is entirely responsible for any continuing increase in residential construction. Single family home construction and sales have gone essentially nowhere since the beginning of 2013. With interest rates turning slightly lower YoY, there will probably be renewed vigor in housing permits, starts, and sales by the end of this year. We have either already seen the interim bottom in permits, starts, and sales, or will shortly. Decelerating and/or YoY declining sales have existed long enough for prices gains to decelerate, although they haven't turned negative. The median price for existing home sales, however, may turn negative in the next 2 months. Interest rates have turned, sales are bottoming, prices are increasing at a quickly decelerating rate, and inventory is still increasing smartly. As per the normal order. A nerd's work is never done. I owe XE.com a column on margin debt from 3 months ago. I owe Angry Bear a column on 401(k)'s that is still in its first draft stage. I haven't finished comparing low vs. high wage job historical recoveries to see if this expansion has been different in quality, or just severity, in terms of the distribution of jobs creatted. As I've mentioned before, if you knew how little time I really have after regular obligations, you'd be surprised I am able to post at all. Despite that, I am going to add on a new challenge. The two most important economic issues to average Americans are jobs and wages. A lot of work has been done as to leading indicators for jobs. For example, the Conference Board has an Employment Trends Index which it calculates from public data sources, and leads the jobs report by about 6 months (It's still rising, by the way). Back in 2009, I wrote extensively about other economic indicators which telegraphed subsequent jobs growth (in particular real retail sales and the ISM manufacturing index), and used them to predict that jobs would hit bottom at the end of that year. Depending on which data revision is current, I was either spot on or off by two months. Since job are one of the four big coincident indicators, the Index of Leading Indicators itself is a decent first approximation of what will happen with job growth in the near future. Secularly wages have been stagnant for almost 15 years. In fact, wages now are below wages in the 1970s in real terms. Cyclically real wages actually rose during the Great Recession due to the temporary collapse in gas prices. With the rise in gas prices, real wages fell into 2012, and with the general sideways movement in gas prices since, real wages have very slowly risen. It would be valuable to be able to confidently forecast the direction of real wages over the next 6 to 12 months. Along with jobs, it is the big concern of most average Americans. I've done some preliminary work, and found a few surprising correlations, enough to be able to at least make a back of the envelope forecast. As time permits, I hope to lay this all out for you in the next month or so, and do a lot more research during the rest of this year to refine an approach towards establishing a leading index for wage growth.